Last Updated: 16 April 2019 - This post contains affiliate links. Deciding on getting a juicer is an easy decision to make but choosing a particular juicer – not so much. Yet a lot of people highly recommend the Breville 800JEXL Juice Fountain Elite, so let’s take a closer look to see if it’s the right juicer for your needs. Or you can use the table of content below to easily navigate to your most pressing question. 1 What is Interesting About the Breville 800JEXL Juicer? 2 Is the Breville 800JEXL a masticating juicer? 3 What do reviews of the Breville 800JEXL say? 4 How Does The Breville 800JEXL Compare? 5 Where can I get replacement parts such as the Breville 800JEXL filter basket? 6 What’s The Best Price for the Breville 800JEXL and where can I buy it? 7 Verdict: Is This Juicer For You? What is Interesting About the Breville 800JEXL Juicer? It’s made in Australia, so people who are wary of “made in China” kitchen gadgets need not worry at all. It also comes with a limited 1-year warranty. Its pulp container is very large at 3.2 quarts. The juice jug that is included in the package measures 1.1 quart (1 liter). The jug has a foam protector so foam doesn’t go into your juice. There are only 2 settings so you don’t have to get confused as to which settings to use. The slow 6500 rpm setting gives you a lot from the softer foods. The high 13000 rpm setting can make short work out of harder produce like apples, beets, and carrots. It is a very well-built machine, with heavy-duty die-cast metal construction along with stainless steel parts to replace traditionally plastic parts. Even the cutting disc isn’t plain stainless steel. It’s also reinforced with titanium. The feed tube offers a very large opening at 3.3 inches wide, so it’s not necessary for you to first chop fruits and vegetables so you can fit them in. Now you may be tempted to use your hand to push the produce down the chute, but you have to avoid this. Just use the food pusher, as that’s the reason it is part of the purchase. The cutting disc is reinforced with titanium, which promises 30% more juice and 40% more vitamins and minerals. It comes with a safety locking mechanism that keeps the unit from operating when you overload it with too much produce. This also protects the motor from overstressing. Is the Breville 800JEXL a masticating juicer? No, it’s not a masticating juicer. But it’s easy enough to mistake it for one since it’s expensive like masticating juicers and it’s also very efficient in producing large amounts of juice. Nonetheless, it is a centrifugal juicer. It offers much quicker results because the speed setting can reach 13000 rpm. In masticating juicers, the speed can only reach a leisurely 80rpm. The 800JEXL has a much powerful motor to reach those speeds, so its operating noise output is much louder. What do reviews of the Breville 800JEXL say? Most of the reviews for the Breville 800JEXL are quite positive, to say the least. Many of them are updated reviews—they were first written a few years ago and the original reviewers have since added their recent observations. And for the most part, the typical updated Breville 800JEXL review attests that the 800JEXL is a very durable machine despite its limited 1-year warranty. I guess there’s something to be said for Australian manufacturing! This is an important factor to consider, because a juicer needs every part to work properly, and these parts are all constantly stressed whenever you use the device. It’s impressive the way the 800JEXL can stand up to the constant pressure. Also, the durability lessens the impact of the initial cost. If you can rely on it to work well for at least 3 years, then the “per year” costs are actually very reasonable. And you’re also spared having to replace your juicer every year. Some reviews also mention that it looks fantastic. Although it’s somewhat bulky for some with dimensions of 9″ (D) X 16″ (H) X 16.5″ (W) there are a lot of bigger juicers out there. And it’s also somewhat heavy too, so it’s not as portable as you may like. But it looks great, so much so that you can just leave it on your countertop and it will surely stand out. Many customers have remarked on how easy it is to use the 800JEXL. There’s not much to figure out about the settings, since there are only 2 of them. The wide feed opening reduces the prep time and effort considerably. And the super effective cutting disc can handle just about anything you put in, although it may not be the best juicer for leafy products like wheatgrass, kale, and spinach. The large containers for the pulp and for the juice also lets you juice a lot at one go without having to keep on changing containers. The juice you get is also quite free from pulp. Finally, the safety mechanisms and the automatic shutoff for the motor keep you from inadvertently overstressing the juicer. A lot has been said about how easy it is to clean too. It’s very easy to disassemble and there are only 4 parts here that need to be washed regularly. Some of these parts can even be cleaned in the dishwasher, and your purchase also includes a cleaning brush. Other juicers may present cleanup problems like having the pulp stuck to some nooks and crannies, or having to remove pulp remnants in the screen. But you won’t have these problems with the 800JEXL. Put a bag in the pulp container and the cleanup becomes even simpler. Many longtime users have reported that this is one durable machine. It works reliably day in and day out, and does so for several years. Moreover, just about everyone is pleased with its performance, and the vast majority of users have remarked that the 800JEXL is worth every cent of the cost. But that doesn’t change the fact that it is very expensive. Not everyone may be able to afford it. Also, if you’re used to a masticating juicer then the high rpm speeds may jolt you with the noise it produces. That’s normal for centrifugal juicers like this one. You are, after all, slicing through fruits and vegetables with metal knives rotating at incredible speeds. So some noise in unavoidable, and some have said that the noise isn’t as disruptive and obnoxious as what you get from other models. Check out the video below to see the Juicer in action! How Does The Breville 800JEXL Compare? The JE98XL was a commercial success, so Breville simply tweaked it for further improvements. It has basically similar features and dimensions, with certain differences. The 800JEXL is more expensive, but it works much better in a commercial setting with its more powerful motor (1000 watts compared to 850). The 800JEXL also looks much better and is much more durable, as the plastic parts in the JE98XL were replaced by heavy-duty die-cast metal. The titanium cutting disc on the 800JEXL performs better than the stainless version on the JE98XL. It has a larger pulp container too at 3.2 quarts compared to the JE98XL’s 2.6 quarts. The 800JEXL has more power (1000 watts), as the BJE510X (900 watts). The heavy-duty die-cast metal construction of the 800JEXL is also more impressive than the stainless steel body of the BJE510X. On the other hand, the BJE510X is more affordable. It also offers 5 speeds in its juicing system, while the 800JEXL is limited to just the 2 (high and low) speeds. Here, the key difference just the number of available speeds. The 800JEXL offers just two speeds, with the slow 6,500 rpm and the fast 13,000 rpm. But the BJE820XL offers 3 more additional speeds in between the fast and slow settings, with rpm speeds of 8100, 9700, and 11300. And you can easily tell at which speed the unit is operating in with the backlit speed feedback lights. All the rest are the same, including the die-cast metal construction. That’s why the BJE820XL is actually more expensive. Both are high quality juicers from Breville, but they cater to 2 very different needs. The 800JEXL is a centrifugal juicer, while the BJS600XL is a masticating juicer designed to match up against the Omega J8006. So while the 800JEXL can operate at a speed of 13,000 rpm, the BJS600XL offers a more relaxed 80 rpm speed that ensures you don’t get any oxidation. There are several crucial design differences too. The BJS600XL uses a lot of plastic parts, but the 800JEXL has replaced those with stainless steel improvements. And the 800JEXL also has a much wider feed tube. These are two very different machines, as the 800JEXL is a centrifugal machine while the J8006 is a masticating juicer. So you can only go for the J8006 if you don’t mind the characteristically slow operation of a masticating juicer. While the 800JEXL can go as fast as 13,000 rpm with its 1,000-watt motor, the 150-watt motor of the J8006 can only offer 80 rpm. Even the 800JEXL’s “slow” setting of 6,500 rpm is extremely much faster. Still, there are several advantages to the J8006 because as a masticating juicer it is much more versatile. You can use it in ways that you can’t use with the 800JEXL. You can use frozen foods, extrude pasta, and grind coffee. You can whip up some soy milk, come up with nut butters from nuts, and also make baby food. A direct comparison between these 2 juicers can really highlight just how good the 800JEXL really is. A masticating juicer like the VRT350 is supposed to squeeze more juice from vegetables and fruits, compared to a centrifugal juicer like the 800JEXL. But the Breville is so efficient in extracting juice that the difference in the amount of juice they produce is minimal. In most other areas, the 800JEXL is just clearly superior. It extracts juice very quickly, because its operating speed is either 6500 or 13000 rpm. Compared to those speeds, the 80 rpm operating speed of the VRT350 is virtually glacial. That’s not the only factor that slows down the juice preparation either. Its mouth is narrow compared to the opening in the 800JEXL, so you’ll first have to chop your fruits and veggies into smaller pieces to get them to fit. The juice flow channel in the VRT350 can also clog more easily. Where can I get replacement parts such as the Breville 800JEXL filter basket? You can always get the replacement parts in the Breville website, although the 800JEXL is pretty reliable and you’ll only probably need a new pulp container every now and then. That costs only $10, while a juice jug to replace (or to add to) the old one only cost $16. You may as well buy lots of pulp containers at once. Or you can be sensible and line the pulp container with a produce bag instead. You can try to take advantage of the free shipping, which takes effect if your purchases total at least $45. Also, you can just replace things right away if the improbable happens and something needs a replacement. What’s The Best Price for the Breville 800JEXL and where can I buy it? 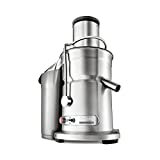 On the official Breville website, you can get the Breville 800JEXL 1000-watt juice extractor for $300. Now you may find some other sellers online who will sell it to you for a discount, although you’ll have to Google these sellers and hope that they don’t run out of stock when they sell it for less. These are sites like Amazon and eBay, where they may also offer Breville 800JEXL refurbished or secondhand. That should reduce the price even further, although you may no longer have warranty coverage. Just make sure that you buy from a reputable ecommerce website like Amazon. And don’t forget to take shipping and handling costs into account when you buy from another website. If you want to buy from Amazon, just remember to check their listing on any given day since prices change very often. Click here to check Amazon for the best price available TODAY. On the official Breville website, you get free shipping. It doesn’t make much sense if the shipping fee is greater than the supposed “discount” on another site. If you’re in a hurry to get your juice in the morning, then a centrifugal juicer like the Breville 800JEXL is for you. This is a great choice when it comes to high speed juicers, with its easy use and cleanup and effective results. It’s also built to last (even if it has a 1 year warranty only). On the other hand, if you want to make sure you get as much nutrients from your health drinks, however, then a masticating slow juicer like the Omega J8006 may be a better option.